Senior goalie Mark Manos stands and defends the net. Manos was honored, along with senior tennis player Sonja Stosic, by being named Drexel’s Athletes of the week. Drexel University seniors Mark Manos and Sonja Stosic were each named Athlete of the Week April 2-8. 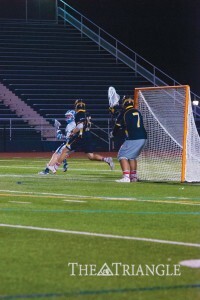 Manos, goalkeeper of the men’s lacrosse team, shone in the team’s 11-8 victory at the University of Delaware March 31. He helped his team improve to 3-0 in Colonial Athletic Association play by saving a season-high 15 shots. It was the third consecutive victory for the Dragons, as they climbed back to .500 for the season following a disappointing 2-5 start. Manos views this recognition as a substantial accomplishment, as he was up against Drexel’s mass pool of athletes for the title. Just like Manos, Stosic is among the group of talented athletes at Drexel. The senior tennis star won her final home matches against St. Peter’s March 31. Teaming up with Zeynep Mafa in a doubles match, Stosic contributed to an 8-1 match victory. She also took her final match 6-0, 6-3, earning her first singles point while playing in the No. 1 spot. The fact that it was her final home match made it extra special. “I’m happy about it since it was my senior day,” Stosic commented. Both the women’s tennis team and the men’s lacrosse team continue to make hard charges toward the finish and their respective CAA championships. “We’ve had some really good wins, playing some really good tennis,” Stosic said. Both players were appreciative of their teammates’ play around them and cited it as a big reason for their recent success. Manos, too, has been supported by his teammates on the field, specifically the defensive unit around him. That type of play will need to persist in order for the men’s lacrosse team to finish the season on a high note. “We need to continue to play well in order to take this team to the CAA Championship,” Manos said.